The Scottish Parliament has marked the first anniversary of the terrorist attacks at Charlie Hebdo magazine’s office in Paris. French-born MSP Christian Allard proposed the motion that the parliament “reflect on the events that took place in Paris on 7 January 2015 at the Charlie Hebdo offices; remember the journalists, the police officer and others who fell victim to the attack; recognise the tragedy as an attack on the right of free speech” and further suggested that henceforth the date be designated a Cartoonists Day, an occasion when rather than dwelling upon the violent act of terrorists we remember the importance of humour, satire and tolerance of dissenting opinion as hallmarks of a healthy democratic society. 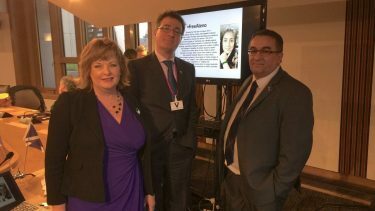 Representatives from the SNP, Labour and Conservative parties spoke as well as Fiona Hyslop, Cabinet Secretary for Culture, Europe & External Affairs who responded on behalf of the Scottish Government.